Micro-fat injection is much systemized procedure and there are several steps. The most important principle in the surgical management is the atraumatic and aseptic transfer of fat and purification of harvested fat because trauma to fat in the process of harvesting or placing fat affects the survival of the graft. Any blood that remains in the harvested fat also facilitates rapid degradation of the injected fat. First, carefully mark the recipient site (usually posterior and lateral thigh) with the patient's agreement while he or she is in the prone position. Sterilely prepare and drape both the harvest site and the recipient site. The technique is designed to harvest the fat in parcels of readily transferable size. Common donor sites include periumbilical and the thigh. 1. Small amount of local anesthetic solution is injected at thigh and a surgeon makes a small stab incision, Through this incision, using a ling syringe, introduce tumescent fluid for complete anesthesia of overall harvesting region. 2. Following tumescent infiltration of the region to be harvested, using an aspiration cannula, a surgeon aspirate and harvest fat by gand or with a mechanical vacuum. 1. Once harvesting is complete, the aspirated fats then art transfered sterilely through mulriple syringes using the tulip connections to 1-mL tuberculin syringes. The liquid fraction of the graft is gently washed free of oil, lidocaine, and blood with this transfer. 2. Using centrifuge, the aspirates divides into 3 layers. The top layer is free oil from ruptured fat cells. The bottom layer contains variable amounts of tumescent fluid and blood and they are drained outside. The middle layer consosts of fat cells for grafting. We prepared this fat for injection to patients. 3. In anticipation of future secondary or additional micro-fat injection, harvested fat cna be frozen to -30°C and reused because a high number of viavle cells exist even after defrosting. 1. Regional nerve blocks are performed to target area of face. 2. A surgeon creates small tunnel and undermines deep tissues for the grafts area, which helps keep the grafted fat adherent to the recipient site and helps even distribution of grafted fat. A surgeon inserts the cannula through a 1-2mm stab incision made by a No. 11 blade scaplel. A surgeon inserts cannula superficially or deeply under the rhytids, depressed area, or scar and injects harvested fat in a controlled method gently. We make slight overcorrevtion vecause grafted fat is, though the amount is different from patients to patients, usually absorbed a little as time goes on. 3. The level of fat grafting varies with the structure being augmented. Fat is grafted from the deep layer to the superficial layer. After placement of micro-fat on your face, a surgeon massages, spread out, or mold the final soft contour of implanted fat. 4. Serial injection may be performed at 1-3 months intervals. Frozen fat can be kept in safe for one year. 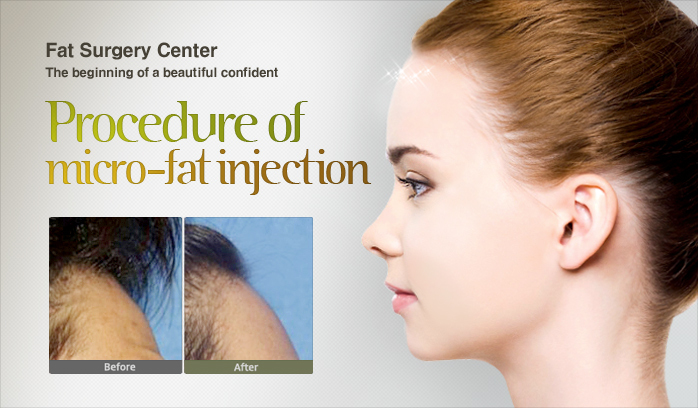 If necessary, we can slowly defrost the frozen fat and secondary micro-fat injection is performed. Micro-fat injection is often required additional injection procedures. As implanted fat tissues are absorbed about 20%-30%, you can often find that initial volume of fat is gradually decreased as time goes on. 1. You must re-visit our clinic and check the amount of fat absorption at 3 months post-operatively. You must re-visit our clinic and check the amount of fat absorption at 3 months post-operatively. If surgeon decide there need secondary fat injection, we can slowly defrost the ready- made or harvested frozen fat and secondary micro-fat injection is performed under local anesthesia. In secondary micro-fat injection, there is no procedure of harvesting fat, therefore, injection procedure is rapid and cost will be reasonable and it may be a quarter in respects to primary micro-fat injection.